Professor of Rangeland Ecology and Management, Russell Rustici Chair in Rangeland Management, CNR Associate Dean of Instruction and Student Affairs. Whether the topic is Inner Mongolian herders or California ranchers, extensive livestock production on rangelands requires negotiation between demand for a relatively predictable flow of products and the inherent unpredictability of an arid rangeland environment. There are property and social relations, practices, and values that are widespread among pastoralists and ranchers that reflect adaptation to the disequilibrium dynamics of the resource base upon which they depend. My work seeks to understand these factors as part of coupled human-natural systems, with the goal of learning how long-term, sustainable management of rangelands can be created, and of contributing to the growing body of literature and theory surrounding the concept of coupled systems. This concept is not uncontroversial, but I find it appealing as rangeland ecologist and manager who must look at social relations in order to understand the structure and function of agro-ecosystems like rangelands used for livestock production. Ongoing studies include research on oak woodland landowners and management in California and Spain, land fragmentation and conservation in oak woodlands, and evaluating ecosystem services from conservation easements. I continue to pursue lines of inquiry and theory I have found useful to my work: ecological models for disequilibrium systems as tools to understand the linkages between human relationships and ecological change; work in political ecology founded in basic notions of who (or what) wins and who (or what) loses in disputes over access to natural resources. Rangeland Systems, 2017, edited by David Briske. Inside: Hruska, T., Huntsinger, L., Brunson, M., Li, Wenjun, Marshall, N., Oviedo, J. and Campos, P. 2017. Chapter 9: Applying the social-ecological systems framework on rangelands. In: Briske, D., ed. 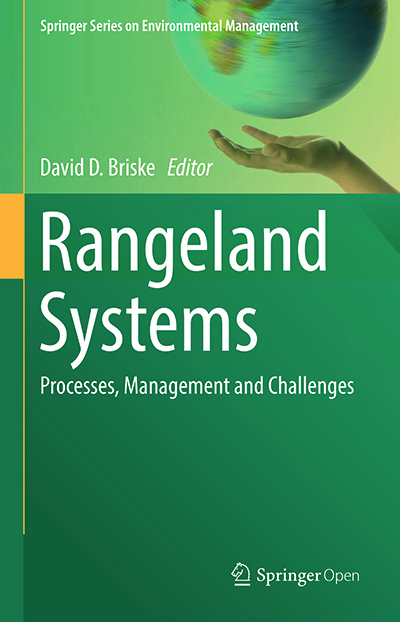 Rangeland Systems: Processes, Management and Challenge. Springer. Campos, P., Huntsinger, L., Oviedo, J.L., Starrs, P.F., Díaz, M., Standiford, R.B., Montero, G. (eds). 2013. 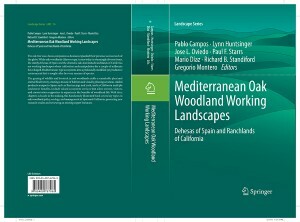 Mediterranean oak woodland working landscapes: Dehesas of Spain and ranchlands of California. Landscape Series, Springer. 460 p.
Van Schmidt, Nathan D.; Kovach, Tony; Kilpatrick, A. Marm; Oviedo, José; Hruska, Tracy; Huntsinger, Lynn; Miller, Norman; and Beissinger, Steven. In press. Integrating social and ecological data to model metapopulations in coupled human and natural systems. Ecology. Shapero, M.W.K., L. Huntsinger, T.A. Becchetti, F.E. Mashiri, J.J. James. 2018. Land manager perceptions of the opportunities and constraints of using livestock to manage invasive plants in California’s hardwood rangelands. Rangeland Ecology and Management 71:603-611. Shuhao Tan , Tingyu Li , Bo Liu , and Lynn Huntsinger. 2018 (in press). How can sedentarized pastoralists be more technically efficient? A case from eastern Inner Mongolia. The Rangeland Journal 40(3):241-249. Zhang, Jian, Yanbo Li, Lynn Huntsinger, and Wenjun Li. 2018. Is microcredit a form of risk for the pastoral households of Inner Mongolia’s semi-arid rangelands? Rangeland Ecology and Management. Campos, Pablo, Alejandro Caparrós, Emilio Cerdá, Luis Diaz-Balteiro, Casimiro Herruzo, Lynn Huntsinger, David Martín-Barroso, María Martínez-Jauregui, Paola Ovando, José L. Oviedo, María Pasalodos-Tato, Carlos Romero, Mario Soliño, and Richard B. Standiford. 2017. Multifunctional natural forest silviculture economics revised: Challenges in meeting landowner’s and society's wants. Forest Systems [S.l. ], v. 26, n. 2, p. eR01S, Oct. 2017. ISSN 2171-9845. Available at: <http://revistas.inia.es/index.php/fs/article/view/10505>. Date accessed: 06 dec. 2017. doi:http://dx.doi.org/10.5424/fs/2017262-10505. Huntsinger, L., Sayre, N. 2017. Chapter 15: Landscape stewardship for rangelands. Pgs. 284-305in: Plieninger, T. Beiling, C. (eds) The science and practice of landscape stewardship, Cambridge University Press. Huntsinger, L., Hruska, T., Shapero, M., Oviedo, J., Nader, G., Ingram, R., and Beissinger, S. 2017. Save water or save wildlife? Water use and conservation in the central Sierran foothill oak woodlands of California, USA. Ecology and Society 22:12. Oviedo, J., Huntsinger, L., and Campos, P. 2017. The contribution of amenities to landowner income: the case of Spanish and Californian hardwood rangelands. Journal of Rangeland Ecology and Management 70(4): 518–528. Huntsinger, L. 2016. Stewarding rangeland landscapes: building social capital to restore natural capital. 2016. In: I. Casasús and G. Lombardi (eds), Mountain pastures and livestock farming facing uncertainty: environmental, technical, and socio-economic challenges. Series A: Mediterranean Seminars, 116: 315-327. Proceedings FAO-CIHEAM Mountain Pastures Network, Zaragosa, Spain, June 2016. ISBN: 2-85352-559-7. Li, W.J., S. Talinbayi , L. Huntsinger. 2016. Comparing transhumance in Xinjiang, China and California, USA. In: I. Casasús and G. Lombardi (eds), Mountain pastures and livestock farming facing uncertainty: environmental, technical, and socio-economic challenges. Series A: Mediterranean Seminars, 116: 69-75. Proceedings FAO-CIHEAM Mountain Pastures Network, Zaragosa, Spain, June 2016. ISBN: 2-85352-559-7. Brunson, M.W., Huntsinger, L., Kreuter, U., Ritten, J. 2016. Usable Socio-Economic science for rangelands. 2016. Rangelands 38(2): 85-89. Huntsinger, L., Plieninger, T., Pullido, F., Starrs, P. 2016. Re: Eletter in response to Naudt’s et al. Europe’s forest management did not mitigate climate warming. Science 352(6273): 597-600. March 2, 2016. Sulak, A. L. Huntsinger, and S. Kocher. 2015 UC plays a crucial facilitating role in the Sierra Nevada Adaptive Management Project. California Agriculture Jan-Feb 68(4): 117-124. Huang, W., B. Bruemmer, and L. Huntsinger 2016. Incorporating measures of grassland productivity into efficiency estimates for livestock grazing on the Qinghai-Tibetan Plateau in China. Ecological Economics 122:1-11. Plieninger, Y., Bieling C., Fagerholm, N., Anja Byg, A., Hartel, T., Hurley, P., López-Santiago, C.A., Nagabhatla, N., Oteros-Rozas, E., Raymond, C.M., van der Horst, D., Huntsinger, L. 2015. The role of cultural ecosystem services in landscape management and planning. Current Opinion in Environmental Sustainability 14:28-33. Briske, D.D., Ash, A.J., Derner, J.D. and L. Huntsinger. 2014. Commentary: A Critical Assessment of the Policy Endorsement for Holistic Management. Agricultural Systems 125: 50-53. Huntsinger, L., N. Sayre, and L. Macaulay. 2014. Ranchers, land tenure, and grass-roots governance: maintaining pastoralist use of rangelands in the U.S. in three different settings. Chapter 4, pgs. 62-93 in: Davies, J. (ed). The governance of rangelands: Collective action for sustainable pastoralism. New York: Routledge. 298 p.
Ferranto, S., Huntsinger, L. and M. Kelly. 2014. 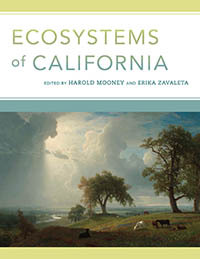 Sustaining ecosystem services from private lands in California: the role of the landowner. Rangelands 36(5):44-51. Huntsinger, L., and Bartolome, J.W. 2014. Cows? In California? : Rangelands and livestock in the Golden State. Rangelands 36(5): 4-10. Sayre, N.F., Carlisle, L., Huntsinger, L., Fisher, G., and Shattuck, A. 2012. The role of rangelands in diversified farming systems: Innovations, obstacles, and opportunities. Ecology and Society. [http://dx.doi.org/10.1186/2041-7136-2-12]. Huntsinger, L., Sayre, L., and J.D. Wulfhorst. 2012. Birds, beasts and bovines: Three cases of U.S. pastoralism and wildlife. Pastoralism: Research, Policy, and Practice 2:12. [http://dx.doi.org/10.1186/2041-7136-2-12]. 中美草场管理政策比较 [Rangeland Management Policy: China vs. USA]. Peking University, College of Environmental Sciences and Engineering, Beijing, graduate seminar, Fall 2015 (with Professor Li Wenjun).